Bike is beautiful, new looking, red with white handlebar tape. The gear shifts are on the diagonal bar below, both wheels are aluminum quick release. There is a small nick in the handlebar tape on the left hand side, on the horizontal area, topside. The body states "Centurion designed Momentum" on the horizontal bar, with "designed" partially faded. "Diamondback" is labeled on the diagonal bar below. 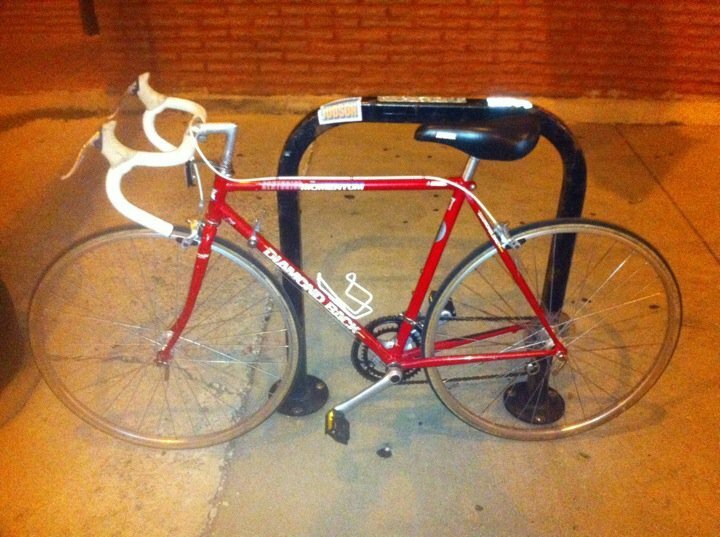 My bike was locked up using a u-lock and cable. While my u-lock wasn't found at the scene, I saw another u-lock that was left. It was fully locked, but cut. Neither my cable or u-lock was found, so I'm supposed they cut the u-lock and made off with the cable - disposing of the u-lock. Update 10/16/10: Recovered on Saturday 10/16 at a south side flea market by volunteer bicycle theft workers as a result of filing this report. Bike was undamaged but pedals had been removed.